A congregation looks to him as its cleric and a state looks to him as its conscience. 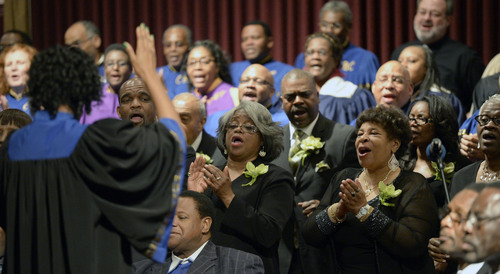 Al Hartmann | The Salt Lake Tribune Members of the Beulah Baptist Church Community Choir sings processional at the Calvary Baptist Church's celebration for Pastor France Davis's 40th anniversary as pastor in a special celebration Sunday April 27 in Salt Lake City. 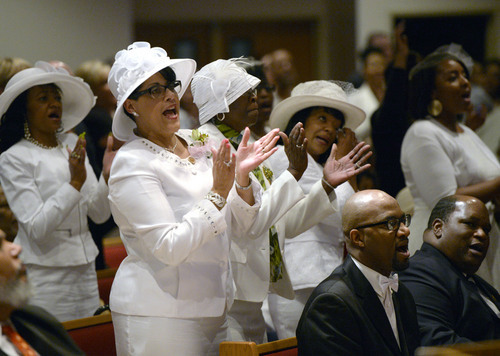 Al Hartmann | The Salt Lake Tribune Members of the Calvary Baptist Church celebrate in song at Pastor France Davis's 40th anniversary as their pastor Sunday April 27 in Salt Lake City. 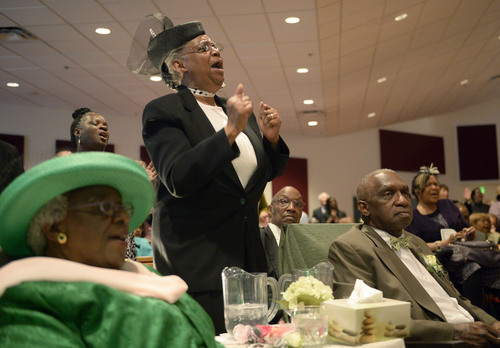 Al Hartmann | The Salt Lake Tribune Members of the Calvary Baptist Church celebrate in song at Pastor France Davis's 40th anniversary as their pastor Sunday April 27 in Salt Lake City. 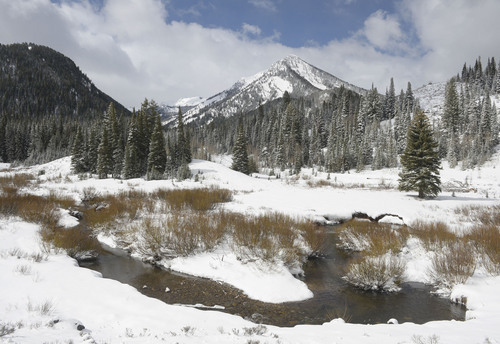 Al Hartmann | The Salt Lake Tribune Sky begins to clear over peaks in Big Cottonwood Canyon Monday April 28, 2014. The mountains received more snow from this weekend's storm, padding the snowpack total for the year. 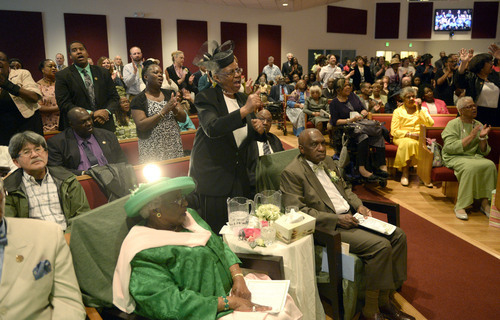 Al Hartmann | The Salt Lake Tribune Members of the Calvary Baptist Church celebrate in song at Pastor France Davis's 40th anniversary as their pastor Sunday April 27 in Salt Lake City. First Lady Wiilene Davis and Rev. France Davis, bottom. 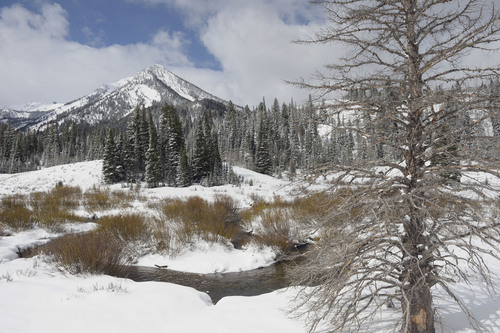 Al Hartmann | The Salt Lake Tribune Sky begins to clear over peaks in Big Cottonwood Canyon Monday April 28, 2014. The mountains received more snow from this weekend's storm, padding the snowpack total for the year. Al Hartmann | The Salt Lake Tribune Rev. 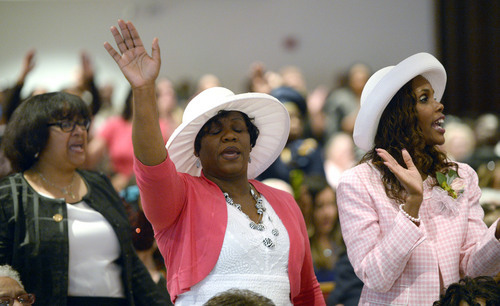 France Davis Davis is esorted up aisle by Sister Leslie Henderson as members of the Calvary Baptist Church celebrate Pastor France Davis's 40th anniversary as pastor Sunday April 27 in Salt Lake City. 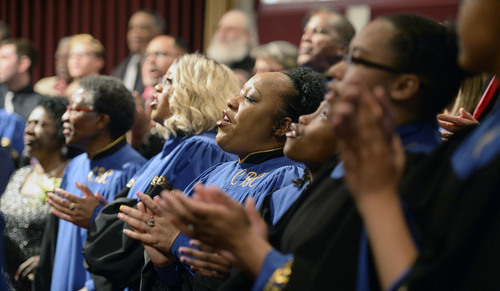 Al Hartmann | The Salt Lake Tribune Members of the Beulah Baptist Church Community Choir sings with the Calvary Baptist Church Choir in celebration for Pastor France Davis's 40th anniversary as pastor in a special celebration Sunday April 27 in Salt Lake City. Al Hartmann | The Salt Lake Tribune Rev. 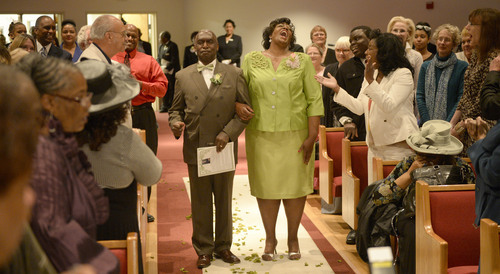 France Davis Davis is escorted up aisle by Sister Leslie Henderson as members of the Calvary Baptist Church celebrate Pastor France Davis's 40th anniversary as pastor Sunday April 27 in Salt Lake City. Al Hartmann | The Salt Lake Tribune Rev. France Davis acknowledges members of the Calvary Baptist Church as they celebrate his 40th anniversary as their pastor Sunday April 27 in Salt Lake Al Hartmann | The Salt Lake Tribune Members of the Calvary Baptist Church celebrate in song at Pastor France Davis's 40th anniversary as their pastor Sunday April 27 in Salt Lake City. First Lady Wiilene Davis and Rev. France Davis, bottom. 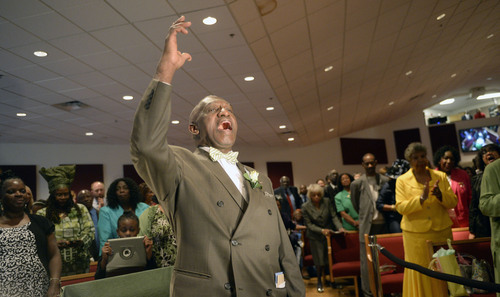 Al Hartmann | The Salt Lake Tribune Members of the Calvary Baptist Church Choir sings in celebration for Pastor France Davis's 40th anniversary as pastor in a special celebration Sunday April 27 in Salt Lake City. 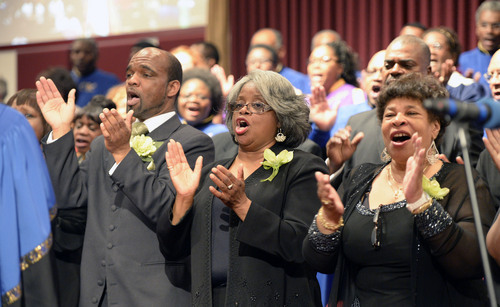 Al Hartmann | The Salt Lake Tribune Members of the Calvary Baptist Church celebrate in song at Pastor France Davis's 40th anniversary as their pastor Sunday April 27 in Salt Lake City. 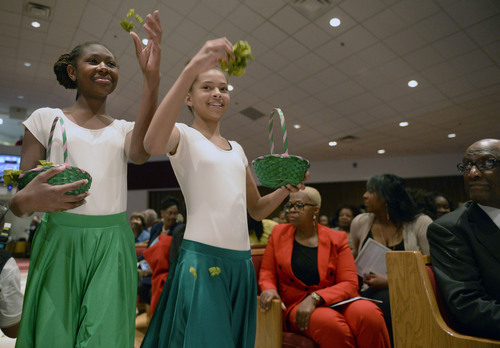 Al Hartmann | The Salt Lake Tribune Members of the Pearls of Praise Dance Group drops flower petals in the aisle in processional at Calvary Baptist Church to celebrate Pastor France Davis's 40th anniversary as pastor in a special celebration Sunday April 27 in Salt Lake City. 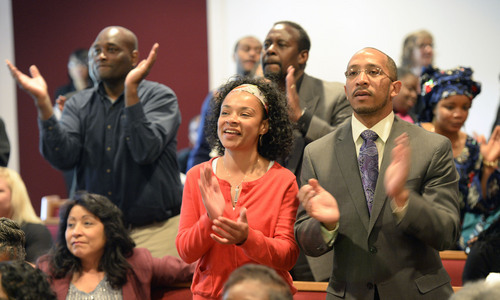 Al Hartmann | The Salt Lake Tribune Members of the Calvary Baptist Church celebrate Pastor France Davis's 40th anniversary as pastor Sunday April 27 in Salt Lake City. The Rev. France Davis has been a fixture on Utah&apos;s faith front for decades. Leading the state&apos;s most prominent black church, the slight, soft-spoken pastor carries himself with dignity, rarely raising his voice. But his words carry an unmistakable moral authority that reaches across government, civic and religious boundaries. And Davis&apos; quiet, steady efforts have built a vast empire of social services for Salt Lake City&apos;s black community. 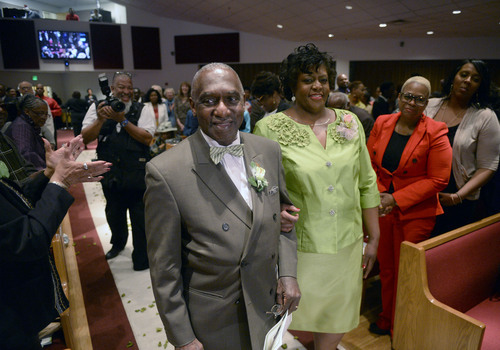 On Sunday, the 67-year-old former civil-rights activist celebrated 40 years of leading Calvary Baptist Church. His hair has a little more gray in it than when the Georgia native arrived in the Beehive State in 1972, but his view of the future is no less passionate or optimistic. Were you religious as a child? Absolutely. I grew up attending a Baptist church in Georgia every Sunday morning and reading the Bible every Sunday afternoon. Even in our school, we had prayer each day before schoolwork and closed the day with a devotion. I never imagined being a pastor, but I did see myself as a serious and committed person. I made a personal commitment to Jesus Christ when I was 12 years old. I figured I needed a balanced life and a part of that was to be spiritually balanced. When I was 19 years old, I decided that the ministry would be my life work, based on my sense of my calling from God. I was living in Fort Lauderdale at the time, after going to college at Tuskegee [in Alabama]. It was in the middle of my civil-rights involvement, right after the March on Washington in 1963, and the Selma [Ala.] march in 1965. I saw him as a role model in terms of the application of spirituality. When you say you believe something, then you need to apply it to your daily life. I was recruited from the University of California at Berkeley in 1972 by the University of Utah&apos;s communication department. I had a one-year appointment to teach news writing and radio. It was an odd call to get. I didn&apos;t know anything about Utah. I saw it as a great challenge and wondered what I could do in a year&apos;s time. In terms of civil rights, Utah was 10 to 20 years behind the rest of the country. When I arrived, I was denied a place to stay initially, which I believe was based on my race. The university took some responsibility for that and worked with me to resolve the issue. I was single at the time, but got married a year later. At the end of the year, the U. offered me a full-time teaching position. A year after that, the church [Calvary Baptist in Salt Lake City] invited me to become their pastor. I already had seminary training and had received my certificate of ordination in Oakland. I had joined the church [Calvary] as soon as I arrived in Utah in 1972, and then became its associate  or interim  pastor when the pastor left in 1973. By 1974, I was teaching at the U. full time and also serving as Calvary&apos;s pastor. How were you received in Utah? Not too long after I arrived, I was at BYU [LDS Church-owned Brigham Young University] and some official decided that my Afro hair and dress were not appropriate and escorted me off the campus. It added to my conviction that Utah was behind the times and that serious changes needed to be made. One of the reasons I have stayed as long as I have is because I thought I could bring about some of those changes. What other kinds of racially motivated opposition have you faced? On one occasion we were protesting the MX missile coming to Utah [in the late 1970s], my office got shot up, with bullet holes riddling the wall. I was not there at the time or they would have been in my lap. I received letters from somebody purporting to belong to the KKK [Ku Klux Klan]. It claimed the Klan was 7,000 strong in Utah and they would pour gasoline on me and burn me alive. I still have that letter. 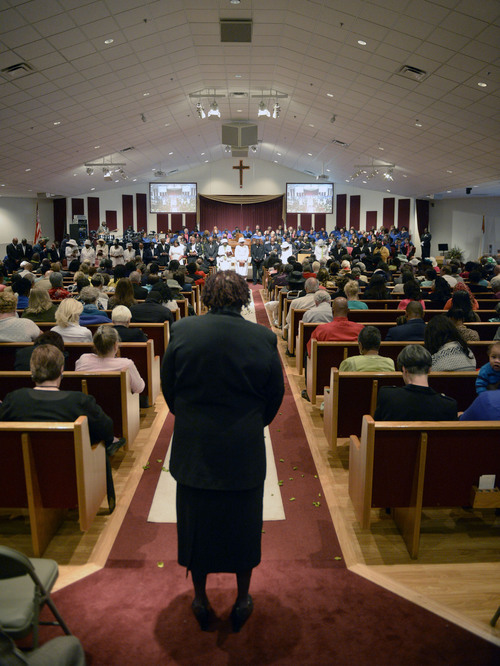 Our congregation, which is mostly black, has endured cross burnings and threats. People have been beaten up because of their race. (The FBI has been involved in most of these cases.) Name-calling is really common. And these incidents continue to this day. What has it been like for your wife, Willene, and three children? My oldest daughter was told she couldn&apos;t walk on the same side of the street as whites. She became student body vice president in her public high school (our kids went to school in the Jordan and Granite school districts) but was not allowed to have music based on her culture during cultural activities. She left for college and didn&apos;t want to come back here. She lives in Dallas. How have you helped members of your congregation adapt to such a white-dominated community? I tell them that we are all in this world together and ought to be able to live peacefully. We are the target of lots of inappropriate behavior, but should consider the source of the attacks. We are not what other people define us as; we must define ourselves. As a congregation, we continue to try to provide education, scholarships, tutoring, early-childhood development and other programs to help our people prepare for what they face in society. Can you describe some of your memorable spiritual experiences? We&apos;ve been separate and apart from the dominant religious group, which has been a positive thing. Having our own place has given us a real sense of community to be ourselves spiritually. It&apos;s been important to be the people God created us to be. How has Utah changed in these past 40 years? We&apos;ve become more accepting. We&apos;ve overridden English-only legislation, worked for fair housing, established a Martin Luther King holiday. I&apos;m hopeful that the community will continue to change in the right direction. We have a major religious organization [the LDS Church] that has admitted to its wrong attitude toward people of African descent. Do you remember where you were in June 1978, when the LDS Church announced that it was ending its ban on black males in its priesthood? Yes. I was at our church when all the press came to find out my reaction. I was surprised that it happened but delighted that no longer would a whole group of people be seen as cursed because of African heritage. What&apos;s your view of the LDS Church? Initially, it was negative, but down through the years, I&apos;ve developed good relationships with Mormon people and leaders at the Church Office Building. We agree to disagree on theological issues and work together on social issues. Any thoughts on your four decades at Calvary Baptist? These have been 40 great years. I&apos;ve built some great relationships and will continue the work of my ministry as long as I can.